MST® also manufactures Breathing Air Filtration Systems without CO removal. Our systems have an extra added "Fourth Stage" of activated carbon to reduce tastes and odors, and offer superior hydrocarbon removal. Replacement filters are economically priced to help lower maintenance costs. 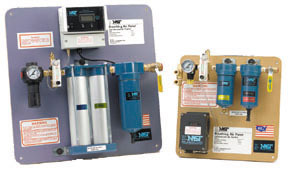 MST's Breathing Air Panel Series "Filtration" System with Superior Filtration capabilities of ANY of our competitors. Since Breathing Air "Filtration" Systems DO NOT REMOVE Carbon Monoxide, and if you purchase an MST Filtration/Monitoring System and discover that CO is a problem in your air lines, we'll be glad to "Trade you Up" to a Respiratory Protector® "Purification System". Just give us a call @ 800-542-6646. Systems available with or without CO Monitoring. 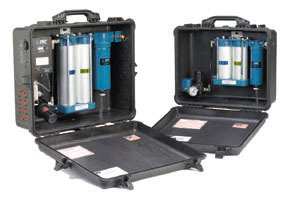 If you don't want portability, take a look at the Panel Mounted Breathing Air Series.Available from 20 SCFM to 600 SCFM.